Has frequency and intensity of cyclones developing over Bay of Bengal increased? 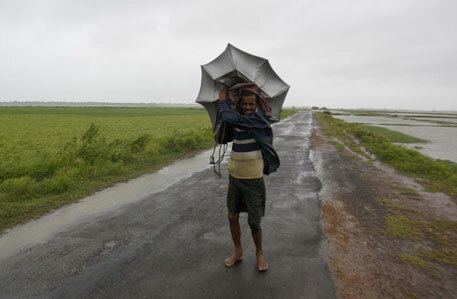 Three very severe cyclones over the Bay of Bengal within a span of two months—Phailin, Helen and now Lehar—has led to a general feeling that the frequency and the intensity of the cyclones in the Bay of Bengal are on the rise. But is that really so? M R Ramesh Kumar, chief scientist with Academy of Scientific and Innovative Research (AcSIR) of Physical Oceanography Division of National Institute of Oceanography (NIO) in Goa, says that is not the case. “I would rather say that 2013 was different in that we had three very severe cyclones one after the other. But with observations for just this year, we cannot say that the frequency or intensity of cyclones forming over the Bay of Bengal is increasing.” If the long term mean or average is taken, the number and intensity of the cyclones has not shown any increasing trend, says he. G Sudhakar Rao, scientist and director-in charge of the Meteorological Department in Hyderabad also said that long-term mean does not show any increase in the frequency. “But the intensity is increasing,” he says. In general, more number of cyclones form over the Bay of Bengal compared to the Arabian Sea because the cyclogenesis (the process of initiation of a cyclone) conditions are more conducive in Bay of Bengal than in the Arabian Sea, says Kumar. “I do not agree that global warming or climate change can play an important role on the intensity or the number of cyclones,” says he. All the seas, including the Bay of Bengal and the Arabian Sea, have warmed in the past several years. “But there has not been any substantial increase either in the number nor the intensity of cyclones,” says he. In 2010, a team of scientists from NIO led by Kumar undertook a study on the effect of global warming on the frequency and the intensity of the cyclones in the Bay of Bengal. The study examined the frequency and intensity of cyclones that occurred between 1951 and 2007. Bay of Bengal was chosen because of its comparatively higher turbulence frequency of cyclones. In order to focus on the effects of global warming on the cyclones, the study period was divided into two parts — 1951-1978 and 1979-2007. The study, which was published in Indian Journal of Geo Marine Sciences in December 2010, clearly indicates that warm sea surface temperatures alone are not sufficient for the initiation of cyclonic systems over the Bay of Bengal. “In addition to sea surface temperature, there are several other environmental parameters such as low level relative vorticity (the rotational flow of winds), minimum vertical wind shear (the resultant of mutually opposing winds between lower and upper troposphere (the troposphere extends from sea-level to an altitude of 15 km) and mid tropospheric humidity that decide the intensity of cyclones,” says he. While high values of mid-tropospheric relative humidity and low-level relative vorticity are conducive to cyclone formation, a high value of vertical wind shear has the opposite effect. The study states that the frequency of storms and severe storms does not show a dramatic rise despite increase of sea surface temperature in the Bay of Bengal from 1951 to 2007 compared to 1901–1951. The study further states that there is large decrease in the mid-tropospheric humidity over the Bay of Bengal during the period 1951–2007 and the number of storms and severe storms have decreased largely during the second phase, 1978-2007, over the Bay of Bengal.